What happened to the summer?! First it was April and suddenly it is October! I wish to thank our Board members, all of whom are listed in this newsletter. We have great times and discussions at our board meetings. A special thanks to Jim Pearce who will put us on a web site that will give Fair Oaks Historical Society worldwide coverage. "Bring a neighbor": Karin Mathis who lives up the street is my neighbor. Many of you know her and she is now our new neighbor member. 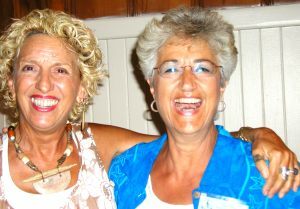 Our past president, RoseAnne Crandell is a new bride and has changed her name to RoseAnne Lamb. Fair Oaks Historical Society wishes both RoseAnne and Leonard many years of happiness. Fair Oaks community gossip has it that Farmer Bob has sold his property. Does this mean we will not be seeing pumpkins stacked on a wagon at Farmer Bob's anymore? Farmer Bob is a part of Fair Oaks history. Fair Oaks Historical Society is the greatest group of people with one thought in mind; we love Fair Oaks and wish to preserve Fair Oaks history. 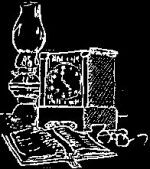 The program for the October 2004's Fair Oaks Historical Society's meeting will be on "My Perspective on Fair Oaks through Art". Our guest speaker will be Benny Barrios, a Fair Oaks resident for 40+ years, father of 5 children, artist, and teacher of art. 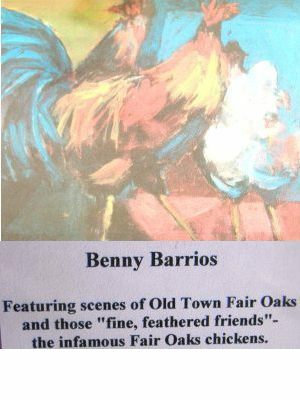 Benny will speak of his life in Fair Oaks and the changes he has seen in Fair Oaks and the surrounding communities by sharing his art with us. 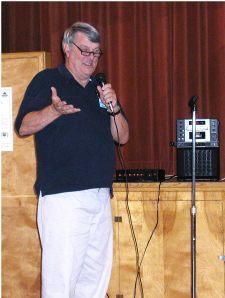 I would like to take this opportunity to thank Jim Pearce for his great presentation on "Fair Oaks Historical Society's (FOHS) Web Page" and to thank him for all his hard work in designing the Web Page. Jim has also volunteered to lead and train a Web Page Committee to assure that FOHS has a wonderful Web Page that will continue to grown and share information about Fair Oaks with those interested in the history of our community. Put your thinking caps on, for January 2005's Potpourri of speakers on life in Fair Oaks. The topic for next years potpourri will be entertaining stories about attending school in Fair Oaks, my children attending school in Fair Oaks, or stories about schools in Fair Oaks. You Vice-President will be calling in December to line up speakers. If you have an entertaining story that you would like to share please call me and let me put your name on the list of speakers. Stories should 3 to 5 minutes in length to allow as many stories to be presented as possible and for all those interested in participating to have time for their story. A beautiful album of the Centennial Celebration of Fair Oaks in 1995 is now on display at the History Center. Included are many photos, newspaper articles and mementos. Stop by and have a look any time. 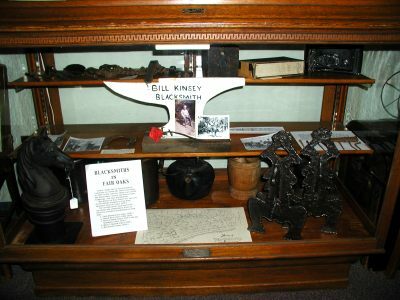 A new exhibit describes Bill Kinsey, the last blacksmith in Fair Oaks. He worked until probably the early 1970's. His sign in the shape of an anvil along with pictures and horseshoes are on display. The History Center is open every 2nd Sunday from 1:00 to 4:00 P.M. and is located in the administration building in the Fair Oaks Cemetery. 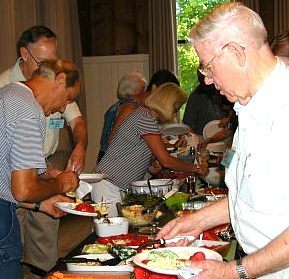 The Nominating Committee appointed at the July 2004 general meeting of the Fair Oaks Historical Society consisted of Chairperson, Dr. Robert Barrett, Mr. Warren McWilliams, and Mr. Joe Dobrowolski. All candidates for office are incumbents, and have consented to nomination. Nominations from the floor are welcome at the general meeting on October 26. We are making good progress with the Fair Oaks Historical Society website. We have established the name www.fairoakshistory.org (as decided by the general membership) with Surewest Internet in Roseville, and transferred the existing content from Jimsweb to the new location. We have also established an initial e-mail address for FOHS as contactus@fairoakshistory.org, and will establish others in the near future for various Society functions. Steve Abbott has volunteered to be the general contact person for the website. We held our first meeting on Wednesday, September 22, where we discussed general issues about the website and did a little technical training. We decided to meet every Wednesday to work on the website until we have the basics done. All the web team members are enthusiastic about the project and I think we have a very productive group. I suspect the web team will be able to decide most of the issues regarding the website (design, project priorities, etc.) but we will probably bring some issues to the Board when we feel the need, and we welcome any suggestions from the Board or general membership regarding the website. Save the Date! - Plan to attend the F.O.H.S. Holiday Open House on Sunday, December 12th at the cemetery. 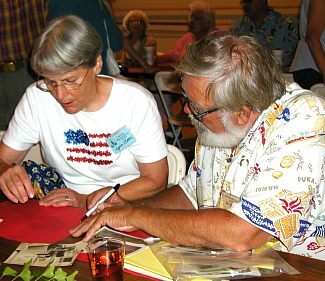 Join us for refreshments and enjoy the collections of the Fair Oaks History Center. The general meetings of the Society are scheduled for January 25th, April 26th, July 26th and October 25th. The Board meetings are scheduled for March 22th, June 21st and September 20th. "Old" friends enjoying a visit!